Weddings come in many shapes and sizes but virtually any wedding occasion includes food. So, what about planning a gluten-free wedding event? If you’re doing the planning, setting a gluten-free menu with a caterer is relatively easy to do. But what about the cake? There is a lot of flexibility when it comes to choosing entrées whereas the cake may seem more limiting for someone looking to accommodate dietary needs. Whether you have a gluten-free bride/groom or gluten-free guests, the big question remains the same: what do I do about the cake? I have a distinct memory of walking by a table promoting gluten-free wedding cakes during my first visit to a gluten-free conference. Despite not having any wedding plans, the table caught my eye. To my shock, I felt my eyes fill with tears. When told by my physician that I must adhere to a gluten-free diet it took me a few weeks to really process the complexity of what it meant to live gluten-free. When I realized that a wedding cake was probably not in my future, I was not particularly bothered by the idea. Cake was out. I could accept that. Regardless, when I saw that wedding cake booth I felt so happy and sentimental. Even at a young age, the idea of a wedding cake was special to me and was a tradition I thought would elude me. So, now that you know you can have a gluten-free wedding cake, the question is how to find one. If you are planning a wedding you have a variety of options for the gluten-free wedding cake. You should choose the option that best suits your needs and your budget. If you want an entirely gluten-free wedding then I suggest finding a dedicated gluten-free bakery in your area and ordering a wedding cake from them. However, if you are not looking for an exclusively gluten-free wedding then you have many options on the table. Living in our nation’s capital, I stumbled across a gem of a bakery: Sticky Fingers. Two-time winner of the show Cupcake Wars, Sticky Fingers Bakery has made quite a name for itself. They pride themselves on offering delicious cupcakes and goodies that are vegan (dairy-free, egg-free), peanut-free and gluten-free. I stopped by their storefront for an official wedding cake tasting, one of the perks of writing an article about wedding cakes! When I arrived there was a small table reserved with a sign that read “Wedding Cake Tasting.” Kamber, the baker, brought out four options for me to try. Even though they make full-size wedding cakes, the cake tasting is done using cupcakes! My personal favorite was the chocolate cake with buttercream frosting and fresh raspberry puree. The sweetness of the frosting was cut so perfectly by the tart berries that it left me wanting bite after bite. Kamber explained that her customers have a lot of say when it comes to designing the perfect wedding cake. Depending on the bakery, you will need to request your cake pretty far in advance. During busy wedding months like May, June, August and September bakeries like Sticky Fingers may need at least a month’s notice, if not more. The amount of time it takes to make your personalized gluten-free wedding cake also depends on the complexity of your design. Kamber also had some great tips on how to save on your gluten-free wedding. Keep reading to see how you can make your wedding delectable and affordable. Let’s get down to the nitty-gritty of wedding cake planning: the cost. Wedding cakes are expensive. They are usually sold on a “per-slice” basis ranging (on average) from $8-$15 per slice. A typical 3-tier wedding cake serves 82 resulting in a cost of around $900. In addition to that already seemingly staggering number, gluten-free cakes are often priced on the higher end of the spectrum. Sticky Fingers charge $2 more per slice when making a gluten-free cake, adding up to $12 per slice. There is no denying that gluten-free options are usually more expensive than their gluten-containing doppelgangers. Luckily, there are plenty of relatively easy ways you can cut down on cost! 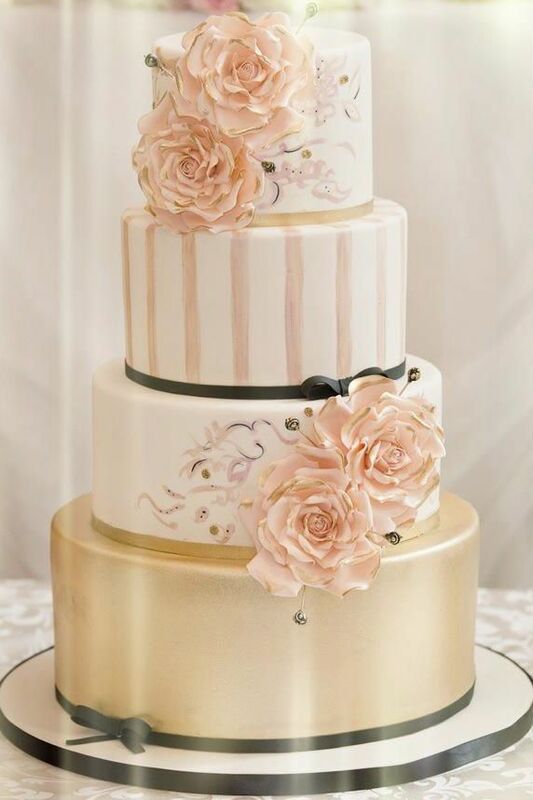 Dual-Cake: If you are a gluten-free bride or groom without many gluten-free guests you can cut down on costs by ordering the top-tier of your wedding cake from a dedicated gluten-free bakery and the rest of the cake from a traditional bakery. If you opt for this make sure you clearly communicate your plan to both bakeries. You will need to separate the top tier from the rest of the cake with cardboard or styrofoam covered in fondant but the cake decorators should be able to do this without any trouble! Go for cupcakes: With the national popularizing of cupcakes, gluten-free options have become fairly common at most cupcakeries across the nation. You can order a traditional looking top-tier then place the cupcakes in lower tiers. You may find that cupcakes are cheaper than ordering an entire personalized wedding cake. Play it up: You can make your cake appear larger by separating the tiers with non-cake layers that are decorated in fondant. If you want the appearance of a grand cake but do not need a huge cake to accommodate your guests this is an affordable way to get the effect you are looking for. You can also use this trick to separate gluten-free tiers from gluten-containing tiers if you opt for cost-savings trick #1. Be Square: when designing your cake, choose a design that allows the tiers to be square-shaped. Squares are easier to cut in a grid pattern so you will be able to cut more slices per tier, cutting down on costs! Bottomless cake: In addition to ordering a small three-tiered wedding cake for wedding pictures, order a few large sheet cakes made with the same type of cake and frosting. The chefs or caterers can cut up the slices in the back and no one will know the difference. The sheet cakes will save you a bundle while you still get the glamorous and traditional wedding cake to display and eventually serve to guests. The most important thing to keep in mind when planning for a gluten-free wedding is to enjoy the process! Weddings are so fun and so special. You may feel like the cake is a gluten-free bump in the road but there are so many options out there for people living gluten-free! Don’t be afraid to ask questions and definitely do your research! Prices will probably vary from bakery to bakery so call around and enjoy the gluten-free cake tastings while you plan your big day!